Introduction: Novel biological insights have led to consensus classification of medulloblastoma into four distinct molecular subgroups. It is widely accepted that medulloblastomas have a higher propensity for extraneuraxial metastases (ENM) compared to other primary brain tumors. We sought to review our own institutional experience of ENM from medulloblastoma. Materials and Methods: Patients with a histological diagnosis of medulloblastoma and ENM were identified from institutional neuro-oncology database. Patient-, disease-, and treatment-related details were retrieved by retrospective review of medical case records. Results: A total of 573 patients with medulloblastoma were registered from 2005 to 2016, of which 13 patients were detected with ENM. Median age of our study cohort was 17 years (range: 3–25 years) at index diagnosis. Ten (77%) patients had desmoplastic medulloblastoma, while 3 (23%) patients had large-cell/anaplastic histology. Five of 7 (71%) patients with known molecular subgroup affiliation belonged to sonic hedgehog subgroup, while the remaining two (29%) were subgroup 3 medulloblastoma. The median time to development of ENM was 13 months (range: 2–72 months) with common sites being bone (77%), bone marrow (62%), and lymph nodes (46%). Median overall survival after diagnosis of ENM was 2 months (range: 1–25 months) with 1-year survival probability of 23%. Patients with desmoplastic medulloblastoma had longer median overall survival compared to anaplastic histology (4.5 months vs. 1 month; P = 0.07). None of the other putative prognostic factors such as age at ENM, concurrent central nervous system involvement, visceral metastases, or time to relapse impacted overall survival. Conclusions: ENM from medulloblastoma, although rare, is frequently associated with desmoplastic histology. Bone, bone marrow, and lymph nodes are the most common sites of extraneuraxial involvement. Survival outcomes remain universally poor mandating the testing of newer agents and/or novel molecularly targeted therapies. Medulloblastoma, the most common pediatric malignant central nervous system (CNS) tumor, is also seen in a small proportion of adults. There is now widespread international consensus that medulloblastoma is a heterogeneous disease that comprises four distinct molecular subgroups (wingless-in-tail [WNT], sonic hedgehog [SHH], Group 3, and Group 4) associated with different developmental origins, distinct clinicopathologic phenotypes, unique transcription profiles, and diverse clinical behavior., Of all primary brain tumors, medulloblastomas have the highest inherent propensity of spreading outside the neuraxis, with a reported frequency of extraneuraxial metastases (ENM) ranging from 2% to 5%. Patient, disease, and treatment characteristics; clinical outcomes; and prognostic factors in ENM from medulloblastoma have been described previously. We sought to review our own institutional experience of ENM from medulloblastoma. The aim of this retrospective single-institution audit was to report the clinicopathological characteristics and survival outcomes in a cohort of patients with ENM from medulloblastoma treated at a tertiary level comprehensive cancer center in India. A prospectively maintained institutional neuro-oncology database was searched electronically from 2005 to 2016 to identify patients with a histological diagnosis of medulloblastoma and ENM. All relevant patient-, disease-, and treatment-related details were retrieved by retrospective review of medical case records including radiotherapy charts. Outcome data were updated through telephonic contact with patients' family members or caregivers. Data on clinicodemographic features, histological subtyping, and molecular subgrouping were summarized using descriptive statistics. Chi-square test was done to find association of factors with early or late relapse at the extraneuraxial site. Early relapse was defined as occurring within 2 years of index diagnosis of medulloblastoma. Time to ENM was calculated from date of index diagnosis (date of surgery) to first documentation of ENM either by imaging or pathology (cytology/biopsy). Survival after ENM was calculated from date of diagnosis of ENM to last follow-up or death from any cause. Survival analyses were done using Kaplan–Meier method and compared using the log-rank test. Any P ≤ 0.05 was considered as statistically significant. The cutoff data for all time-to-event analyses was July 30, 2017. In view of retrospective nature of the study, waiver of consent was granted by the Institutional Ethics Committee. All analyses were done on the Statistical Package for the Social Sciences version 21.0. (IBM Corp, Armonk, NY, USA). Electronic search of the neuro-oncology database identified a total 573 patients with histological diagnosis of medulloblastoma registered at the institute between 2005 and 2016. Thirteen of these 573 (2.3%) patients who developed ENM constitute the present study cohort. Individual patient, disease, and treatment characteristics of the study cohort (n = 13) are summarized in [Table 1]. The median age of the study cohort at first presentation (index diagnosis of medulloblastoma) was 17 years (range: 3–25 years). Ten of 13 (77%) patients had their index primary tumor located laterally with epicenter over the cerebellar hemisphere. As per conventional clinicoradiological risk-stratification criteria, 7 (54%) patients were classified as average-risk disease defined as postoperative no or minimal residual tumor ≤1.5 cm2 × 1.5 cm2 (R0) and absence of any metastases (M0) while 6 (46%) patients demonstrated high-risk features such as postoperative residual tumor >1.5 cm2 × 1.5 cm2 (R1) and/or presence of metastases. All patients were offered standard postoperative adjuvant therapy with curative intent at initial diagnosis as per their risk stratification. Patients with average-risk disease (R0M0) received craniospinal irradiation (CSI) to a dose of 35 Gy/21 fractions followed by boost irradiation (19.8 Gy/11 fractions) of the entire posterior fossa (before 2010) or tumor bed (since 2010) for a total primary site dose of 54.8 Gy/32 fractions over 6.5 weeks. Patients with high-risk medulloblastoma received either standard dose CSI (35 Gy/21 fractions) or extended dose CSI (40 Gy/24 fractions) followed by boost irradiation of the entire posterior fossa (19.8 Gy/11 fractions or 14.4 Gy/8 fractions, respectively) for a total primary site dose of 54.4–54.8 Gy/32 fractions over 6.5 weeks. Boost irradiation of nodular metastatic deposits either in the spine or brain (5.4 Gy/3 fractions–9 Gy/5 fractions) simultaneously during posterior fossa boost was at the discretion of the treating physician. Typically, 4–6 weeks after completion of radiotherapy, patients with high-risk disease were offered 6 cycles of adjuvant platinum-based multiagent systemic chemotherapy. The histopathology of all patients was reviewed by a dedicated neuropathologist as part of standard institutional practice. Ten of 13 (77%) patients had desmoplastic medulloblastoma, while the remaining three (23%) had large-cell/anaplastic histology as per the World Health Organization (WHO) classification. Molecular subgroups were assigned based on differential expression of 12 protein-coding genes and 9 microRNAs. Information on molecular subgrouping was available in 7 of 13 (54%) patients, results of which have been reported previously. In brief, 5 of 7 (71%) patients with known subgroup affiliation belonged to the SHH subgroup, while the remaining 2 patients belonged to subgroup 3. Given its prognostic significance, molecular subgrouping has now been incorporated in the recent update of the WHO classification for CNS tumors. Only 1 of 13 patients was detected with ENM at initial presentation (during postoperative staging workup), while 12 of 13 (92%) patients developed ENM later in their course of disease evolution. Imaging findings and histopathological features in a representative case of ENM from medulloblastoma from our study cohort are depicted in [Figure 1]. Magnetic resonance imaging (MRI) of the brain and spine was available for all patients at the time of ENM. Five of 13 (38%) patients were controlled in the neuraxis at the time of ENM, whereas 8 (62%) patients had concurrent CNS involvement either neuraxial dissemination (n = 7) or isolated local tumor-bed relapse (n = 1). Most patients were symptomatic at the time of ENM with bone pain and swelling being the predominant symptoms. 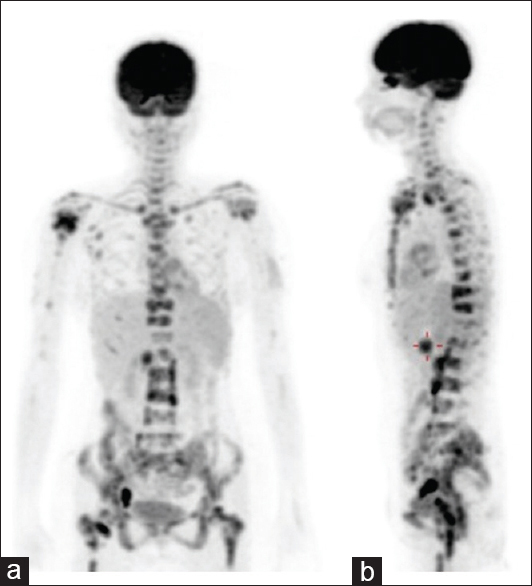 Whole-body 18F-fluoro-deoxy-glucose positron emission tomography/computed tomography (FDG-PET/CT) was performed in 9 of 13 (69%) patients at the first suspicion of ENM [Figure 2]. One child with incidentally detected hepatic lesions on ultrasound also underwent additional liver imaging for better characterization of lesions as her ultrasound-guided fine-needle aspiration cytology from the liver lesion was reportedly inconclusive. Pathological diagnosis either on biopsy or cytology was attempted from accessible site (s) of ENM in all patients excepting one (who had rapidly progressed on radiotherapy with disseminated vertebral metastasis on MRI). The most common sites of ENM were bone (77%), bone marrow (62%), and lymph nodes (46%). Liver metastases were detected in 2 (15%) patients whereas pancreatic, pleural, peritoneal, and subcutaneous metastases were detected in 1 patient (8%) each. It is pertinent to note here that biopsy with appropriate contemporary pathology techniques enabled reliable discrimination between ENM and second malignant neoplasm (SMN) such as bone marrow infiltration from medulloblastoma versus leukemia, nodal metastases versus lymphoma, and isolated solitary bony metastasis versus Ewing's sarcoma. The median time to development of ENM was 13 months (range: 2–72 months). Concurrent CNS failure was more commonly seen in patients with early-onset ENM compared to late relapses (83% vs. 33%; P = 0.10), though not statistically significant. Similarly, extranodal failures were more frequent in patients with early ENM (71% vs. 50%, P = 0.59). Other factors were not appreciably different between early- and late-onset ENM. After detection of ENM, the intent of treatment was essentially palliative with 7 of 13 (54%) patients receiving just best supportive care. One patient with ENM at initial presentation was treated with curative-intent standard radiochemotherapy upfront and later received palliative radiotherapy and oral metronomic chemotherapy at further extraneuraxial progression. Another patient with extensive involvement of cortical bone and bone marrow was treated with 18 months of cyclical oral metronomic chemotherapy with etoposide and cyclophosphamide with complete metabolic response on whole-body FDG-PET/CT. He remained in sustained remission for over 2 years after diagnosis of ENM but died in a road traffic accident (unrelated cause). The child with incidentally detected liver metastases was given palliative intent systemic chemotherapy with complete regression of liver lesions (based on targeted liver ultrasound) after 3 cycles but subsequently progressed massively in the brain leading to neurologic death. Palliative radiotherapy was offered to patients with painful bony metastases whenever required. Additional imaging was not routinely considered during further progression of ENM. The median overall survival of the study cohort after the first documented ENM was 2 months (range: 1–25 months) with a Kaplan–Meier estimate of 23% at 1 year. Patients with ENM from desmoplastic medulloblastoma tended to have longer median overall survival [Figure 3] compared to anaplastic histology (4.5 months vs. 1 month; P = 0.07) just trending toward statistical significance. As previously reported, in patients with known molecular subgroup affiliation (n = 7), SHH-pathway tumors had numerically better median survival, though statistically nonsignificant (3 months vs. 1 month; P = 0.24) compared to Group 3 medulloblastoma [Figure 3]. None of the other putative prognostic factors such as age at ENM, concurrent CNS involvement, visceral metastases, or time to relapse impacted overall survival. However, given the small number of patients involved, such statistical comparisons and interpretations may not be entirely appropriate and valid. 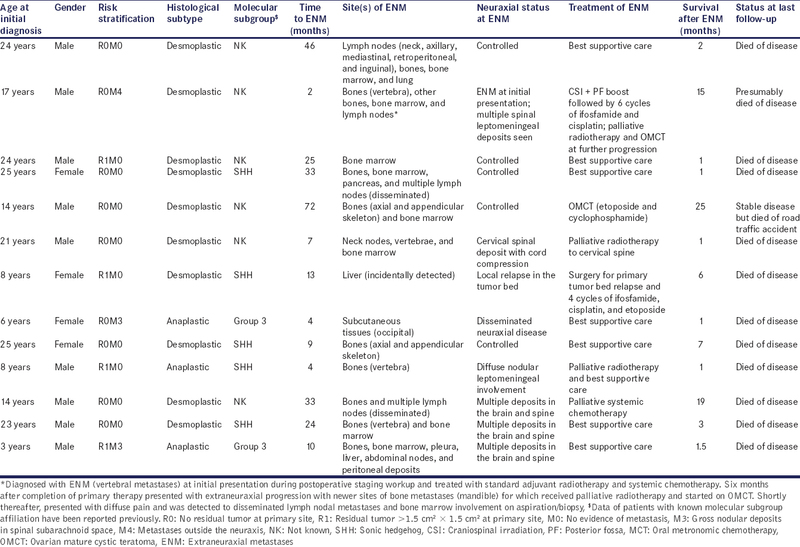 Incremental advances in neurosurgical techniques, improved radiotherapy planning and delivery, and newer chemotherapeutic agents have consistently and progressively improved the prognosis for medulloblastoma. In parallel, novel insights and improved understanding of disease biology have led to its consensus classification into four molecular subgroups,, leading to a more robust and refined risk-stratification system with potential to guide the optimization of adjuvant therapy. Although relatively rare, it is widely accepted that among all primary brain tumors, medulloblastoma has the highest inherent propensity for ENM, with a reported frequency ranging from 2% to 5%. The patterns of relapse in childhood and adult medulloblastoma are somewhat different with a higher proportion of ENM in the adult population. The first literature review on systematic metastases in medulloblastoma included 119 patients (30 of which were adults) and reported a mean ENM rate of 7.1%. Bone was the most common site of ENM (77%) followed by lymph nodes (33%). Survival after ENM was poorer in children compared to adults (5 vs. 9.5 months). In another large cohort of 103 patients with medulloblastoma, ENM was detected in 8 patients (7.7%) at mean interval of 23 months (range: 8–53 months) from initial diagnosis. ENM was associated with poor prognosis with all patients either dying or having further disease progression within 1 year from diagnosis of such metastases. Mazloom et al. published the largest (n = 119) and most comprehensive systematic literature review of ENM in medulloblastoma. The most common site of ENM was bone (84%), followed by bone marrow (27%), lymph nodes (15%), lung (6%), and liver (6%). ENM developed within 3 years from initial diagnosis in the large majority (80%) of patients with a reported median time of 16 months (range: 0–167 months). Patients were treated variably at the time of ENM with a median overall survival of 8 months after diagnosis of ENM. Concurrent CNS involvement, visceral metastases (lung or liver), younger age (<16 years) at ENM, and shorter time interval (<18 months) from initial diagnosis to ENM were negative prognostic factors for survival. More recently, Young et al., reported 4.8% mean overall rate of ENM in a retrospective cohort of 292 patients with medulloblastoma at a median of 18 months (range: 2–208 months) from initial diagnosis. The findings of our study correlate well with previously published reports.,,,, Like other cohorts, significant proportion of patients belonged to adult age group. Bone, bone marrow, and lymph nodes were the most common site of ENM. In the lone patient developing subcutaneous metastases over the occipital region at 4 months from date of surgery, the possibility of seeding along the surgical route cannot be completely disregarded. One such case had been reported where relapse along the suboccipital scar was seen along with involvement of other nodal regions. The likelihood of ENM is generally higher within the first 2 years of initial diagnosis; the median time to development of ENM in our study was 13 months, which is in accordance with previously reported literature.,, Whole-body imaging with FDG-PET/CT may be considered in patients with suspicion of ENM and is particularly useful to identify diffuse marrow involvement as well as asymptomatic visceral metastases. It is recommended to obtain biopsy from accessible site(s) to reliably establish the diagnosis of ENM and differentiate from SMN, now increasingly seen in long-term survivors of medulloblastoma. Despite aggressive multiagent systemic chemotherapy, prognosis after diagnosis of ENM remains universally poor, with virtually no long-term survivors. In our study, therapy at ENM was individualized based on evolution of disease, prior therapy, performance status, and patient preferences. This is a single-institution study of patients with medulloblastoma treated uniformly with standard adjuvant therapy at initial diagnosis (as per risk stratification) at a comprehensive cancer center. Imaging data at ENM and final outcomes were available for all patients included in our study. However, some caveats and limitations remain. First, our study suffers from all the inherent biases of any retrospective analyses. Second, it is limited to a small number (n = 13) of patients with ENM from medulloblastoma. Finally, 13 of 573 (2.3%) patients with medulloblastoma being detected with ENM can only provide a crude estimate of relative frequency but cannot be used to compute the actual incidence of ENM in medulloblastoma. Surveillance for medulloblastoma in routine clinical practice is generally limited to neuraxial imaging; hence, many patients would not be detected, unless symptomatic for their ENM. Being a tertiary referral center, a significant proportion of patients go back after treatment to follow-up with primary care physicians at their native place with lack of updated follow-up. ENM from medulloblastoma, although rare, is frequently associated with desmoplastic histology. Bone, bone marrow, and lymph nodes are the most common sites of extraneuraxial involvement. Treatment after detection of ENM is essentially palliative as survival outcomes remain universally poor mandating the testing of newer agents and/or novel molecularly targeted therapies. Ostrom QT, Gittleman H, Liao P, Vecchione-Koval T, Wolinsky Y, Kruchko C, et al. CBTRUS statistical report: Primary brain and other central nervous system tumors diagnosed in the United States in 2010-2014. Neuro Oncol 2017;19:v1-88. Taylor MD, Northcott PA, Korshunov A, Remke M, Cho YJ, Clifford SC, et al. Molecular subgroups of medulloblastoma: The current consensus. Acta Neuropathol 2012;123:465-72. Gupta T, Shirsat N, Jalali R. Molecular subgrouping of medulloblastoma: Impact upon research and clinical practice. Curr Pediatr Rev 2015;11:106-19. Schweitzer T, Vince GH, Herbold C, Roosen K, Tonn JC. Extraneural metastases of primary brain tumors. J Neurooncol 2001;53:107-14. Varan A, Sari N, Akalan N, Söylemezoğlu F, Akyüz C, Kutluk T, et al. Extraneural metastasis in intracranial tumors in children: The experience of a single center. J Neurooncol 2006;79:187-90. Paulino AC. Extraneural metastasis in medulloblastoma. In: Hyatt MA, editor. Tumors of the Central Nervous System. Vol. 8. Netherlands: Springer; 2012. p. 71-5. Mazloom A, Zangeneh AH, Paulino AC. Prognostic factors after extraneural metastasis of medulloblastoma. Int J Radiat Oncol Biol Phys 2010;78:72-8. Zeltzer PM, Boyett JM, Finlay JL, Albright AL, Rorke LB, Milstein JM, et al. Metastasis stage, adjuvant treatment, and residual tumor are prognostic factors for medulloblastoma in children: Conclusions from the children's cancer group 921 randomized phase III study. J Clin Oncol 1999;17:832-45. Giangaspero F, Ebehart CG, Haapasalo H. Medulloblastoma. In: Louis DN, Ohgaki H, Wiestler OD, Cavenee WK, editors. WHO Classification of Tumors of the Central Nervous System. Ch. 8. Lyon: IARC; 2010. p. 132-40. Kunder R, Jalali R, Sridhar E, Moiyadi A, Goel N, Goel A, et al. Real-time PCR assay based on the differential expression of microRNAs and protein-coding genes for molecular classification of formalin-fixed paraffin embedded medulloblastomas. Neuro Oncol 2013;15:1644-51. Gupta T, Dasgupta A, Epari S, Shirsat N, Chinnaswamy G, Jalali R, et al. 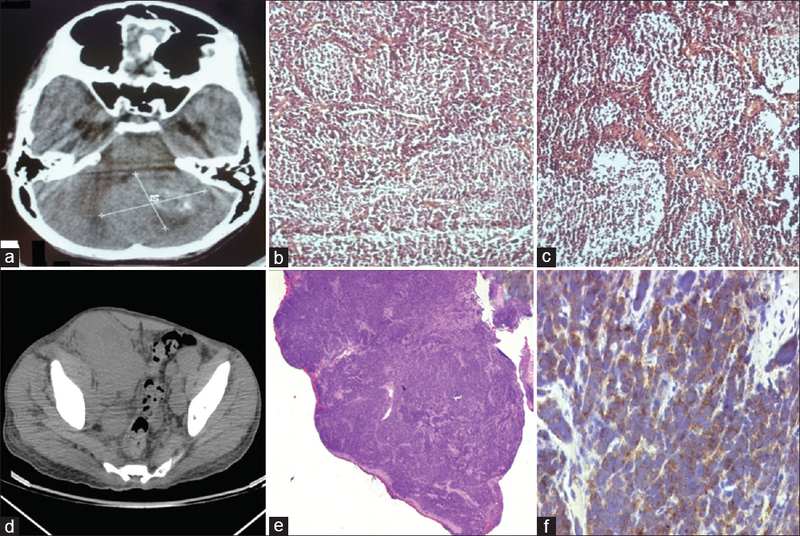 Extraneuraxial metastases in medulloblastoma: Is histology and molecular biology important? J Neurooncol 2017;135:419-21. Ramaswamy V, Remke M, Bouffet E, Bailey S, Clifford SC, Doz F, et al. Risk stratification of childhood medulloblastoma in the molecular era: The current consensus. Acta Neuropathol 2016;131:821-31. Zhang N, Ouyang T, Kang H, Long W, Thomas B, Zhu S, et al. Adult medulloblastoma: Clinical characters, prognostic factors, outcomes and patterns of relapse. J Neurooncol 2015;124:255-64. Rochkind S, Blatt I, Sadeh M, Goldhammer Y. Extracranial metastases of medulloblastoma in adults: Literature review. J Neurol Neurosurg Psychiatry 1991;54:80-6. Kochbati L, Bouaouina N, Hentati D, Nasr C, Besbes M, Benna F, et al. Medulloblastoma with extracentral nervous system metastases: Clinical presentation and risk factors. Cancer Radiother 2006;10:107-11. Young RJ, Khakoo Y, Yhu S, Wolden S, De Braganca KC, Gilheeney SW, et al. Extraneural metastases of medulloblastoma: Desmoplastic variants may have prolonged survival. Pediatr Blood Cancer 2015;62:611-5. Mastronuzzi A, Miele E, Po A, Antonelli M, Buttarelli FR, Colafati GS, et al. Large cell anaplastic medulloblastoma metastatic to the scalp: Tumor and derived stem-like cells features. BMC Cancer 2014;14:262. Gupta T, Krishna U, Epari S, Kurkure P, Jalali R. Newly-detected solitary bony lytic/sclerotic lesion with soft tissue mass in a previously treated case of high-risk medulloblastoma: Importance of contemporary pathology techniques to differentiate second malignant neoplasm from extra-neuraxial metastasis. J Brain Spinal Cancer 2015;1:7-14. Goldstein AM, Yuen J, Tucker MA. Second cancers after medulloblastoma: Population-based results from the United States and Sweden. Cancer Causes Control 1997;8:865-71. Muoio VM, Shinjo SO, Matushita H, Rosemberg S, Teixeira MJ, Marie SK, et al. Extraneural metastases in medulloblastoma. Arq Neuropsiquiatr 2011;69:328-31. Yoon JW, Gilbertson R, Iannaccone S, Iannaccone P, Walterhouse D. Defining a role for sonic hedgehog pathway activation in desmoplastic medulloblastoma by identifying GLI1 target genes. Int J Cancer 2009;124:109-19. Dasgupta A, Gupta T, Pungavkar S, Shirsat N, Epari S, Chinnaswamy G, et al. Nomograms based on pre-operative multi-parametric magnetic resonance imaging for prediction of molecular subgrouping in medulloblastoma: Results from a radiogenomics study of 111 patients. Neuro Oncol 2018. Doi: 10.1093/neuonc/noy093. Rudin CM, Hann CL, Laterra J, Yauch RL, Callahan CA, Fu L, et al. Treatment of medulloblastoma with hedgehog pathway inhibitor GDC-0449. N Engl J Med 2009;361:1173-8. Samkari A, White J, Packer R. SHH inhibitors for the treatment of medulloblastoma. Expert Rev Neurother 2015;15:763-70.